Disturbed habitats, dunes. Uncommon on the NC Coastal Plain; rare in the NC Mountains and Piedmont, where it is probably not native. Wild Poinsettia is also known as Fire-on-the-mountain and has been considered, Euphorbia cyathophora, Euphorbia graminifolia, Euphorbia barbellata, Euphorbia heterophylla, and has sometimes been placed in the genus Poinsettia. Although it has been recorded statewide (including in the mountains), it is more commonly seen in the sandy coastal plain; Weakley (2015) considers it native on the NC Coastal Plain, non-native in the NC Piedmont and Mountains. 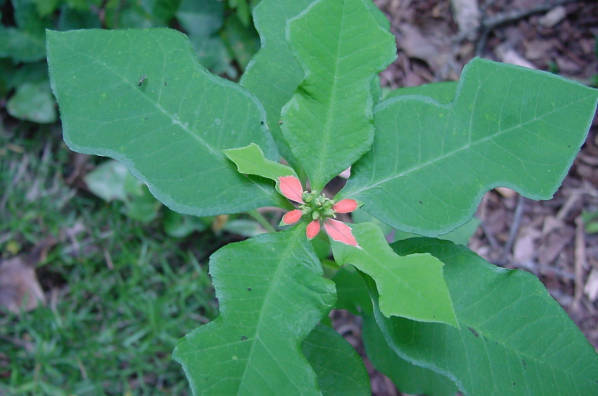 The showy parts of the plant are not the flowers, but the red bracteal leaves. The plant can become weedy and sometimes loses the showy color. The blooms are actually small and are above the colorful bracts.